I managed to squeeze in a DIY this weekend! I am participating in a local charity auction that is raising funds for our local Christmas Bureau, called Chairs for Charity. The goal was to create a chair that represents who you are, your blog and your aesthetic. While I couldn't find the "right" chair, I had one collecting dust in my home, another "vintage" Ikea chair. 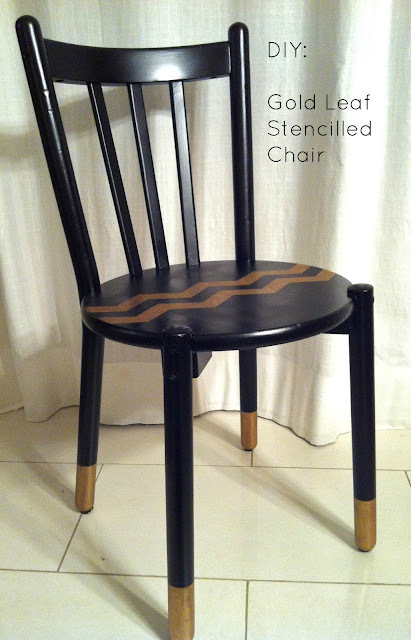 I am all about black and chevrons, and lately really digging gold. 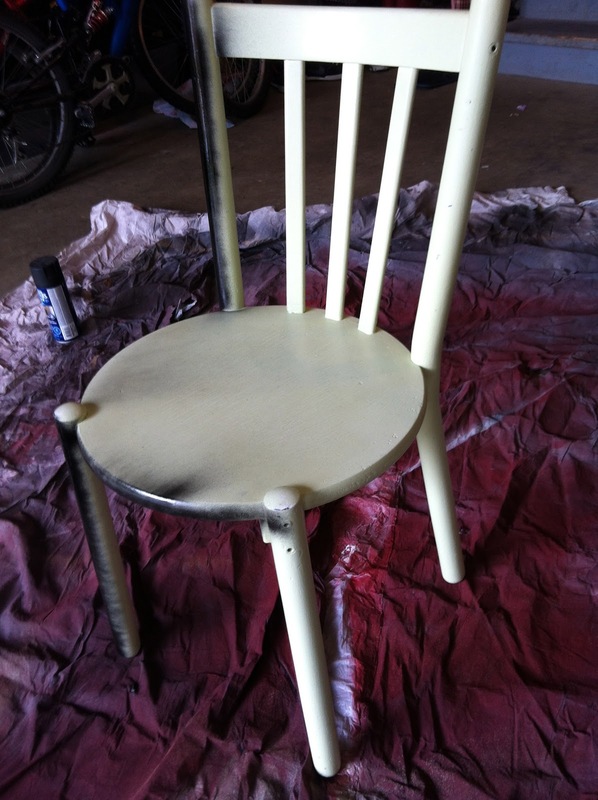 So with a bit of black spray paint, some Scotch 3M Painters tape and Rub'N'Buff, I re-vamped my little chair. I can see it in a teen's bedroom, non? Since I work all day, my only chance to take photos are at night with my iPhone. If you are in the area, please stop by The Passionate Home in Langley, on Thursday, October 25 to place a bid on a chair! 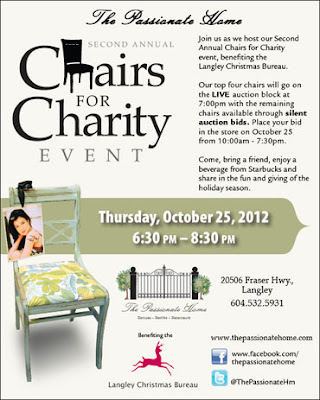 All proceeds go to the Langley Christmas Bureau, which helps families in need during the holiday season. I know that Ashli from Mini Manor blog created one too! Oh this is so you!!! What a great gesture.... Have a fabulous week Barb!! And a stylish chair, at that! Oh how fun! Wish I could have joined in :) What an incredible idea for a charity auction! Super cute! I'd bid on it. It looks great! I love that idea to raise money for charity! aww real great there Barb - i love it! and for charity? what a stylish seat ! Agree - this is so you! Looks great Barb! Definitely you Barb!! It's a great looking chair now. So CUTE!!!!! I love the little gold feet and the chevron is FABULOUS!!! p.s. thank you so much for the shout out!!! That is a good looking chair Barbara! Way to go. Your chair turned out GREAT Barbara! Good luck at the auction today!! fun!! now Barb, how did you get the clean chevron look when you have excess tape on the black painted portion? I only painted on the inside of the tape, creating two zig zags. But it is the tape that 3M gave me that is amazing---clean, crisp lines! Love your DIY and such a great cause. Good to see your new teaching job isn't taking up all your time! Great DIY chair! Love the chevron.